"Data Recovery - How to Recover and Restores Your Lost Files?" The Data Recovery is the process of retrieval of inaccessible, deleted or corrupted data from digital media that has become damaged or has been corrupted in some way. So, the recovery of data not only restores lost files but also recovers corrupted data. The data recovery normally refer to recover data from devices such as hard disk drives (HDD), memory cards, pen drives, tapes, mobile phones, personal digital assistants, diskette, CD or DVD discs and many more items. However, recovery of data mostly refers to the recover data from HDD. Logical failure - there can be corruptions in firmware, semiconductor failure, or accidental partition or file failure/deletion, viruses, a storage device could have been dropped, a hard disk drive may have been "accidentally" formatted. On the basis of different lost reason, we can adopt different data recovery methods. There are software and hardware reasons that cause data loss, while we can recover data by software and hardware ways. Professional Recovery Company/Specialists - look at your computer hard drive to determine what caused the hard drive to malfunction and doing the recovering job. Data Recovery Software - must install the program before disaster is happen and difficult to use when the drive having a hardware failure. Always backup your important data before any problems happen. If you hear a ticking or a scratching noise that come from your computer hard drive, shut down the PC immediately. If you don't shut down and allow the failing hard drive to continue running, it is only a matter of time before it destroys itself - which will ultimately result in the loss of data. If you believe there is something wrong with your computer (especially hard drive) shut it down, do not continue to power up because you may do more damage. Never try to fix the hard drive yourself unless you know exactly what and how to do it. Package the hard drive properly when you need to send it in to a professional data recovery specialist/centre. You can cause additional damage to the hard drive if it is poorly packaged. DO NOT use or download any files to the hard drive that you need to recover data from until after your lost data has been recovered to your satisfaction. Do not ever assume that data recovery is impossible; even in the worst cases, such as natural disasters data recovery companies have been able to retrieve valuable data form some very badly damaged hard drives. Never remove the cover from the hard drive; this will only cause further damage. Do not subject the drive to extreme temperatures changes both hot and cold. Being different from prevention and backup, data recovery is the remedial measure. The best way to insure the security of your data is prevention and backup data regularly. To operate and use your data according to the normative steps, you can reduce the danger of data loss to the lowest. 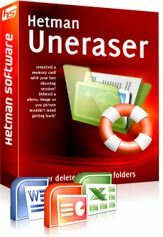 Download Hetman Uneraser Software Now! Click on the image to view the details of the software.